The two galaxies happen to be oriented so that they appear to mark the number 10. The left-most galaxy, or the "one" in this image, is relatively undisturbed apart from a smooth ring of starlight. It appears nearly on edge to our line of sight. The right- most galaxy, resembling a "zero," exhibits a clumpy, blue ring of intense star formation. 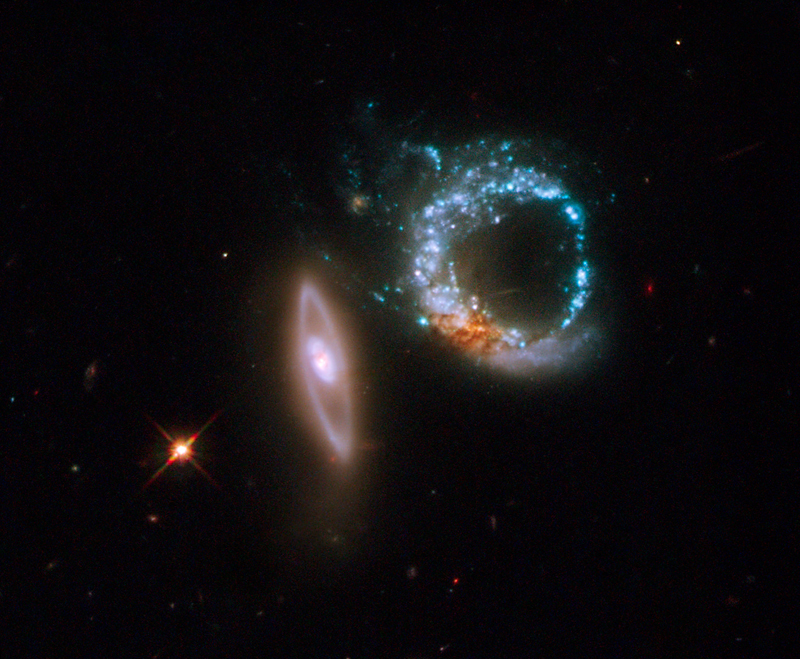 The blue ring was likely formed after the galaxy on the left passed through the galaxy on the right, with the gravitational forces that resulted creating a ring of higher density at the point of impact. As this dense material collided with outer material inward from the gravitational pull of the two galaxies, the resulting shocks and dense gas that were produced, spawned star formation. If you look at the lower left of the blue ring you can see a dusty reddish knot that probably marks the site of the original nucleus of the galaxy that was hit. in the initial collision. As you look at that stunning image (click it to see the larger original) keep in mind that that was taken with the old camera. Just imagine what we'll see next year! We were so eager to ask whether we could . . .